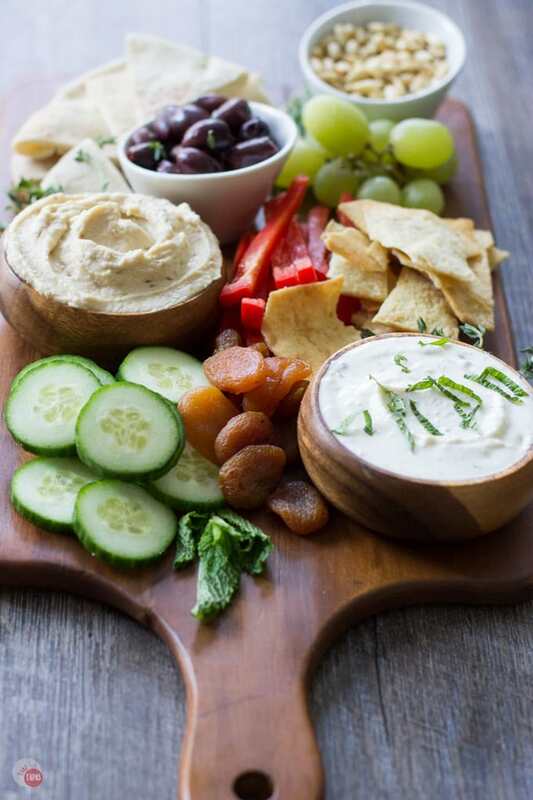 Take your holiday entertaining to the Mediterranean with a tapas platter complete with hummus meze and other snacks to keep your guests happy! With holiday entertaining in full swing, I sometimes run out of gas when planning menus and making holiday appetizers. The easiest thing to do is make a cheese board and let people snack on that. I have really relied on these tapas platters and cheese boards to help me get through the day. And the night for that matter. And this busy season to help ease the stress of holiday entertaining. Throwing the traditional cheese board on its head, I am not using cheese this time, but hummus. I guess you can call it a hummus board and I’m ok with that but I’m going to call it a Hummus Meze Platter because there is much more than just hummus! Mediterranean Tapas Meze Platter for Your Holiday Entertaining. Boar’s Head recently came out with an amazing line of hummus flavors. Hummus originated in Egypt and is now popular throughout the Middle East and other countries. Probably because it is so delicious!!! The combination of chickpeas and tahini is beyond crazy good and I love the addition of different flavor profiles to the base recipe. 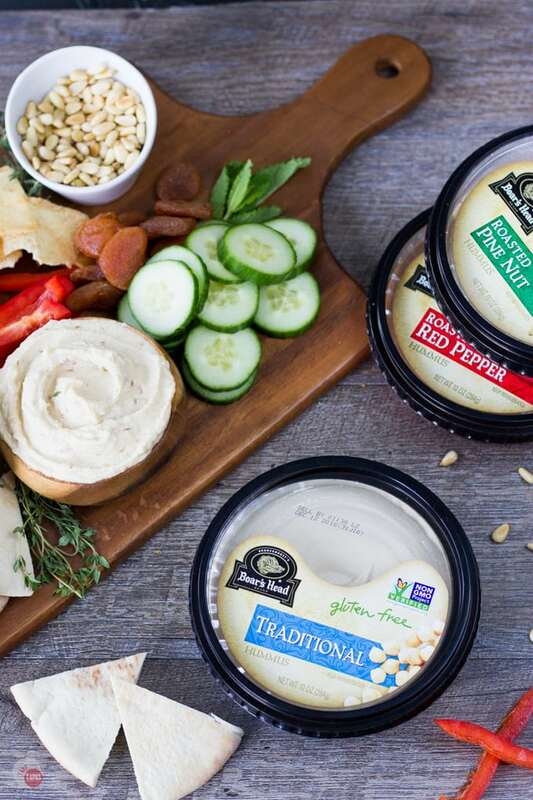 Boars Head’s hummus is Non-GMO and gluten-free so if you have some dietary restrictions, don’t worry! Plus, I love all the protein I am getting so I can feel good about snacking on it! I have been making a lot of cheese boards lately and I love coming up with new foods and new flavor combinations to add to them. During my last trip to the grocery store, I was strolling around the deli section looking for new meats and cheeses and came upon the new flavors of Boar’s Head Hummus. What’s the difference between tapas and meze? I immediately had an idea to change my cheese board into a “tapas” or “meze” board. Tapas is a Spanish term for a variety of appetizers or small plates that usually include olives and cheese. Meze is essentially the same thing but the term originated in Persian and Turkish regions. Basically, it is small plates and snacks used for grazing. Grazing just happens to be my second favorite pastime! For this hummus meze and tapas board, I decided to use foods from the Mediterranean region to keep it legit. For those of you on the Mediterranean Diet, this board is for you! 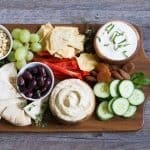 What can I serve with hummus? Some of my favorite vegetables I love to eat with hummus are cucumbers and red pepper slices. Carrots are great too but not really a Mediterranean vegetable and it might make your eggplant jealous. 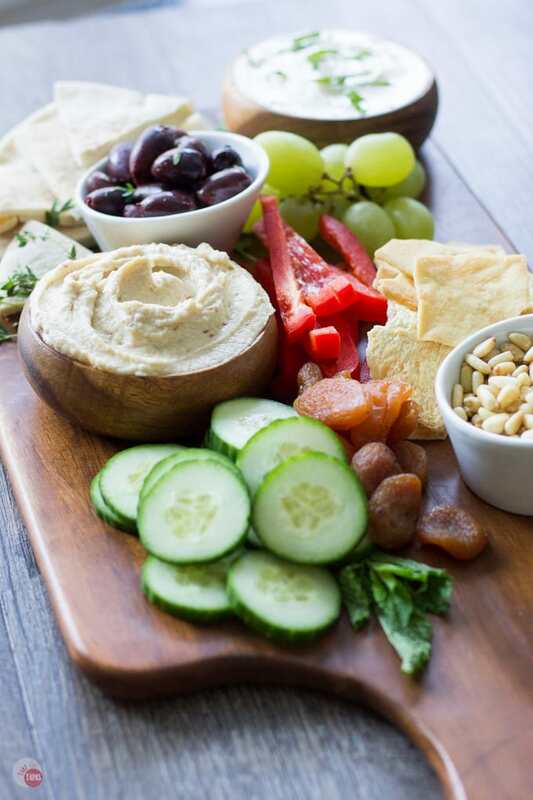 Instead of the same cracker I always use, I decided on pita bread for this hummus meze board. Pita is very popular in Middle Eastern cuisine and in the Mediterranean and makes a great stand-in for American crackers. Along with the soft pita bread, toasted pita chips add a nice crunch and texture contrast with the hummus. My cheese boards always contain a nut of some sort so I thought a toasted pine nut would go great on this meze platter. Boar’s Head has a roasted pine nut hummus flavor so I stole the idea and toasted some in a dry skillet. These tiny nuts add a nice texture to the creamy hummus and whipped feta spread when sprinkled on top. Snacking on this hummus meze platter is the perfect way spend time with friends and family this holiday season. And it keeps you from getting too stressed. Combine the feta cheese and whipped cream cheese in a food processor. Add the milk and puree until smooth and fluffy. Remove from processor and stir in the sliced mint. Store in a bowl in the fridge until ready to serve. Assemble all your ingredients and arrange on your board or serving platter. I enjoy eating hummus and your tray is Amazing. I really like the idea of having different toppings to eat with my hummus. Cheese boards are my favorite thing to bring to a party!! Yours looks fantastic! This is the way that I love to eat – little bites of delish all over the place. It’s perfect for the holidays! I’ll be having ti all holiday break too! That is a gorgeous spread right there! 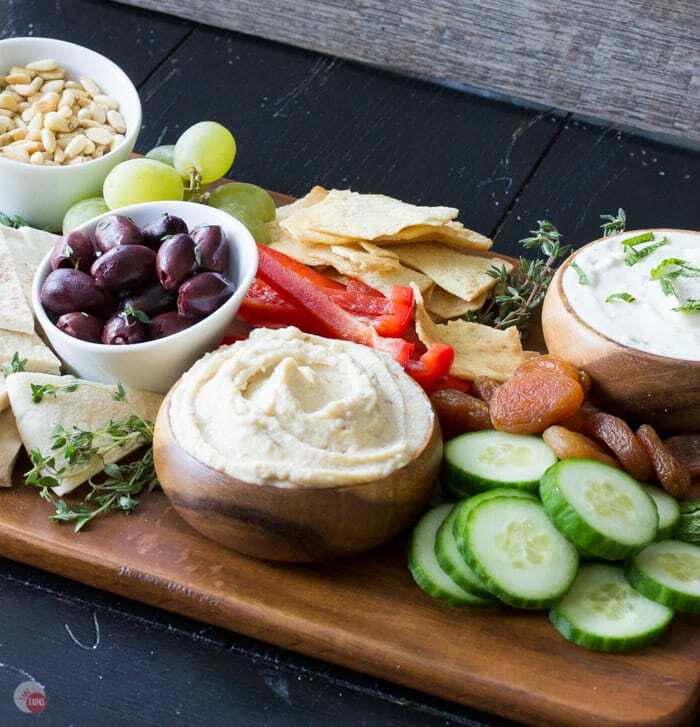 Hummus is always a hit at gatherings and paired with another dip like your whipped feta mint spread gives guest lots of flavor combinations to try. Beautiful platter. I’m going to keep an eye out for Boar’s Head Hummus! Looks fantastic, i’d make a meal of it! I love tapas, and it’s one of our favorite fun meal nights! We often start with hummus, so I’ll definitely be on the lookout for this Boars Head hummus! Looks fabulous! Can’t wait to take one to my next holiday party. 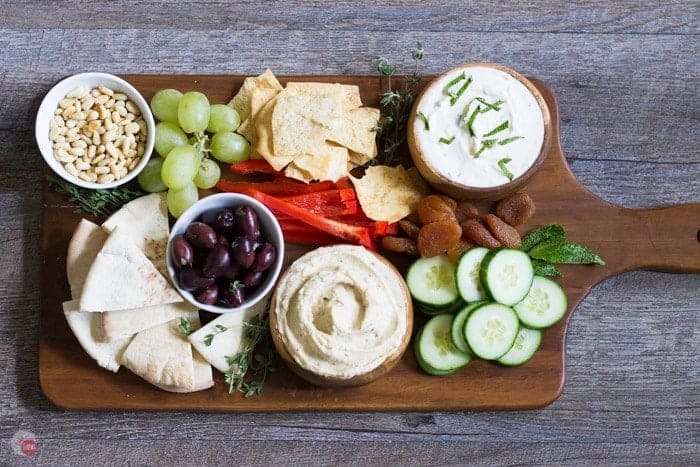 We are huge fans of anything-Boar’s Head but have yet to try their hummus; it looks absolutely divine; particularly with your beautiful presentation here; fantastic job! I eat all of their products and this is my new favorite! I love hummus but have never made it from scratch. I’m sure it is so much better! 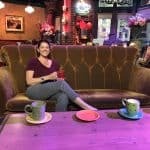 I love the say you serve it! This is a perfect noshing platter! I could truly eat this every day!